Boeing has completed production of the 100th P-8 Poseidon multi-purpose, maritime patrol aircraft at the company's factory in Washington state. Boeing has used its 65 years' experience in transitioning the commercial aircraft into military aircraft to deliver the 100th P-8 Poseidon. The P-8 industry team at Boeing’s factory in Washington uses a first-in-industry in-line production process and Boeing’s existing Next-Generation 737 production system to efficiently design and build P-8 aircraft. Each P-8 carries with it a little piece of Australia, with the 737 ailerons designed and built at Boeing’s advanced manufacturing facility in Melbourne’s Fishermans Bend. Additionally, Boeing Aerostructures Australia’s over 1,200 employees are the sole source producers of 737 ailerons, 747 moveable leading edges and 777 cove lip doors, elevators and rudders. In South Australia, Boeing is keeping Australia’s fleet of P-8A Poseidon’s mission ready with teaming partner Airbus under the P-8A Interim Sustainment Support contract. Earlier this year, Boeing delivered a comprehensive P-8A training solution at RAAF Base Edinburgh to ensure Royal Australian Air Force pilots and mission crews are prepared to take full advantage of the P-8A Poseidon capabilities for any mission, at any time. Increased strengthening for low level (down to 200 feet) operations and high angle turns. A derivative of the 737-800 Next Generation, the P-8 combines superior performance and reliability with an advanced mission system that ensures maximum inter-operability in the future battlespace. The P-8A aircraft has an extensive communications system including radios and data links across VHF, UHF, HF and SATCOM. An internal fuel capacity of almost 34 tonnes allows the P-8A to conduct low level anti-submarine warfare missions at a distance of greater than 2,000 kilometres from base. The P-8A will be compatible for air-to-air refueling with the KC-30A MRTT. 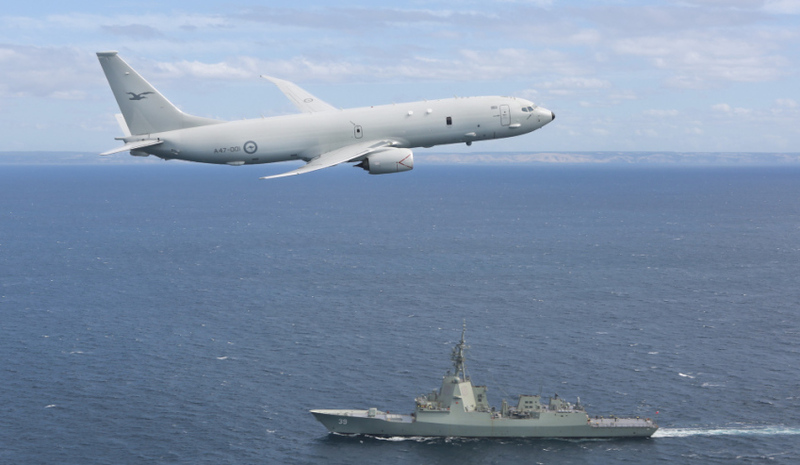 Australia has committed to purchasing 12 P-8A Poseidon aircraft, which will replace the ageing fleet of P-3C Orion aircraft. Australia's first aircraft arrived in Canberra on 16 November 2016, with the remaining 11 aircraft to be delivered by March 2020. IOC for the first eight P-8As is scheduled for the period 2017-2020.